Inti—the sun god—dives down into the depths of Lake Titicaca. With temples and corn fields and virgins. Help the Quechua prosper and multiply and conquer new lands. Till it spreads as far as modern-day Panama to the north and Chile to the south. Forts protect the empire, temples pay homage to the gods and crops thrive in plenty. At the peak of the Inca Empire, Inti sends for Manco again. High in the Urubamba Mountains to save your people,” he commands. Where the power of Inti resides in the Intihuatana astrological sun stone. Spanish conquistadores with Pizarro ravage the Inca nation with smallpox and guns. They build Christian churches on top of Inca temples, statues of Jesus replace Inti. They melt the golden statues of all the Gods for Queen Isabella in Madrid. 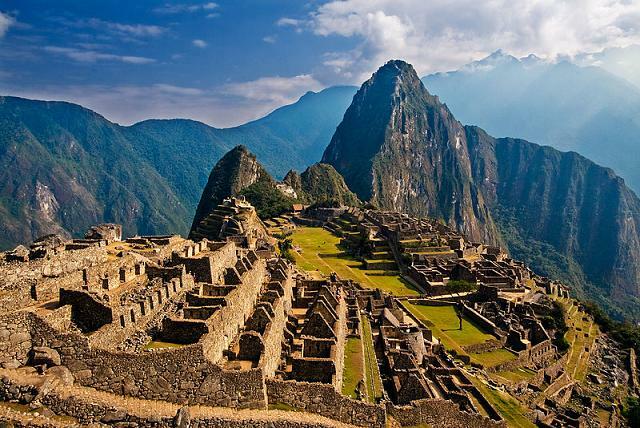 They never find Machu Picchu, hidden two thousand meters high into the sky. Inti guards the sacred city for five more centuries from the horsemen. Much like other palefaces did from the temples of Taj Mahal, Angkor and Baghdad. Over time, the Peruvian city is declared a world heritage site by the same thieves. In 1981, I walk the four-day hike up to this sacred city. Humming birds and giant ferns wave to me on the misty trail. At the loss of a dynasty that embraced all gods. Circled by the Urubamba River, the city breathes ancient power and glory. I sleep overnight in an Inca bath looking again for Inti among the Milky Way stars. A disc-shaped spinning object with pulsating lights hovers above the city at dawn. Has Inti finally come back to claim his city, his people and his sun stone? Intihuatana – A rock carved out of granite bedrock that means ‘trapping the sun’ in the Quechua language. During equinoxes and solstices, when the sun is overhead, the stone casts no shadow suggesting that the Incas knew astronomy. It may have been used to help the Incas determine agricultural planting times. The writer: Mohezin Tejani developed a passion for books and travels during his early life in Africa. Born in Tanzania to Ismaili parents of Indian ancestry, he grew up in Uganda where he spent his childhood and early adult life. Then in 1972, along with 80,000 other fellow Asians, he was expelled during Idi Amin’s reign of terror, and first fled to England and then to America of the late sixties and early seventies. He spent the next four decades on the road as a political refugee and a humanitarian aid worker. The above piece is part of a collection of essays, poems, and letters written over four decades of travel across five continents. Tejani’s latest book Thank You Idi Amin: A Memoir of the Asian Exodus was published by Global Vision Press and has received critical acclaim. Excerpts and links to his other writings can be found on his website: www.motejani.com. Share this article with others via the share option below. Please visit the Simerg Home page for links to articles posted most recently. For links to articles posted on this Web site since its launch in March 2009, please click What’s New. Sign-up for blog subscription at top right of this page. We welcome feedback/letters from our readers on the essay. Please use the LEAVE A REPLY box which appears below. Your feedback may be edited for length and brevity, and is subject to moderation. We are unable to acknowledge unpublished letters.